I had just graduated high school and was a couple weeks into my new research internship at The Whale Museum. I was settling into my regular routine of heading to Lime Kiln Point State Park every morning, where another intern and I would spend mornings in what was informally known as the "acoustics shed". We would plug headphones into a pair of dusty old computers and analyze recordings made on the park's hydrophones, assessing both sound quality and identifying specific vocalizations made by the Southern Resident killer whales. It was these many hours spend in the acoustics shed where I learned how to identify all the discrete calls. Occasionally one or the other of us would pull off the headphones and we would discuss the nuances of a particular call type. Is this an S7, or an S12? Why? At midday a researcher from another project would come in to get weather data off our computers, and this was cue that it was time for lunch. We would all congregate at a picnic table to eat sandwiches, chips, and fruit. There were five or six of us spending our summers at the lighthouse, and we were periodically joined by a rotating cast of other characters: visiting friends and family, whale aficionados from elsewhere on the island, or visitors who came to the park hoping to see the whales. Some of these visitors, we learned, made annual pilgrimage to Lime Kiln from Seattle, or California, or Texas, or Holland. We became an informal whale community, swapping stories of past whale encounters and looking over photo ID guides, discussing how to identify certain whales that had more generic saddle patches. I walk down the familiar trail to the lighthouse with my camera, backpack, and lunch. The morning calm hasn't yet left the water and when I see one of the researchers he tells me that half of J-Pod went north a few hours earlier. That's okay: I hope to see the whales, but mostly I wan to come and spend a whole day sitting at the lighthouse. It's something I haven't done much of in recent years. The summer of 2003 was my first of five years interning for The Whale Museum. The call types I learned helped me write my undergraduate thesis on killer whale vocal communication. 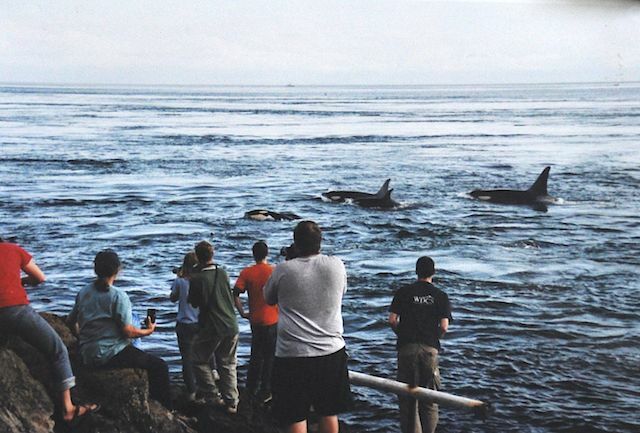 I continued with photography, and published a book of orca photographs in 2007. 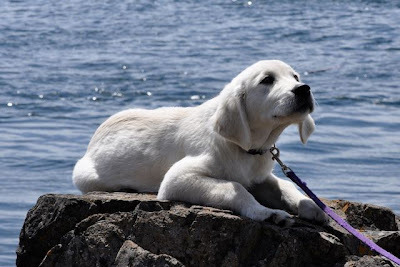 These last few years, working full time as a naturalist on a whale watch tour boat, were fulfilling in some ways, but also left something lacking. I've stepped away from working as a naturalist this season, and I'm re-evaluating my direction in life. I didn't go on to get a Masters degree in bioacoustics as I foresaw as a new high school graduate. I don't work on the boats anymore, despite so many people telling me that was the perfect job for me. But I'm still here, at Lime Kiln, waiting for whales. Some things haven't changed. I don't have to sit on the rocks long this morning before a couple of people I know walk up. 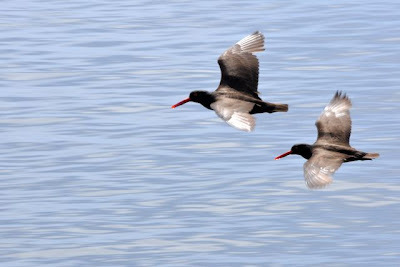 We sit and look at the birds fishing in the ebb tide. 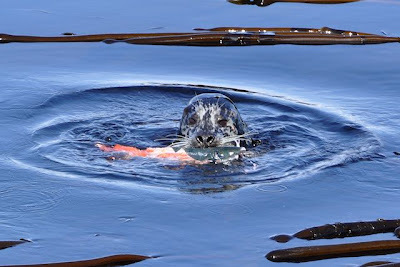 A seal pops up in the kelp with a salmon and we pull out our cameras. My friends move on, and I find another place to lay on the rocks and start a new book. As the sun warms up I pull out my lunch and eat it while watching dragonflies and swallowtail butterflies, listening to nothing but the sound of the gentle waves. Just when I'm starting to think about heading home to the chores that await me there, someone calls out, "Monika, we've got whales!" Out of nowhere, the other half of J-Pod is upon us, in a rare mid-day June moment of being unaccompanied by the commercial whale watch fleet. I immediately recognize J34 Doublestuf and pull out my camera as strangers gather on the rocks above me. The whales quickly pass by, with a few tailslaps and distant breaches, and most of the tourists are gone. I walk around to the other side of the lighthouse and am surprised to see that I know almost all the people sitting there, and have known them for five or even ten years. Bob, the researcher. Billy, the park ranger. Wendy and Megan, the mother and daughter who make annual visits here. Diane, who used to intern for Bob, and now lives on the island. Mary, the volunteer naturalist. Like the whales that just passed by, there have been some changes in our whale community over the last eight years. J11 Blossom has passed away. I haven't spoken to my fellow acoustic intern from 2003 since that last late summer evening. 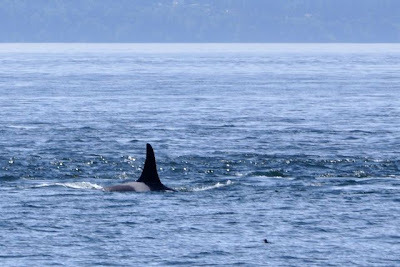 J28 Polaris has a new knick in her dorsal fin and a small calf in tow. Diane is now married with a brand new puppy. J22 Oreo is a familiar presence, the same as ever. So is Bob, the summer resident researcher collecting data on the boats and whales as they pass the lighthouse. There's something grounding to me about spending a full day at Lime Kiln. I spent more than seven hours there yesterday, something I haven't done in years. I got sunburned. I read half a book. I ate a picnic lunch. I talked with old friends. I just sat and looked - there's never nothing to look it. Great post and photos, Monika! This park sounds like a great place to view wildlife. And I just love that cute puppy. Great introspection and reflection. I really love your prose. Should be in a book, not in a blog. Nicely done (as I've said often). Thanks for sharing your thoughts and pictures. I fully understand the experience of those days gone by, since I shared many of them with you. You captured it very well with this blog and I hope you will continue to have more of those wonderful days. Wendy and Megan, the mother and daughter who make annual visits here....wondered where my sister-in-law and niece had disappeared to!!!!! - they should be in Italy What a coincidence! Maddy is almost as cute as Frank! Hope wherever Ruffles is there's a never ending supply of huge salmon for him.